Often times modelers dread having to duplicate some rather complex camouflage shapes and one which comes to mind are German splinter camouflages. I've been known to spend several hours masking a Bf-109 only to spend 10 minutes painting and then hoping there was no leakage as I equally laboriously removed the tape. 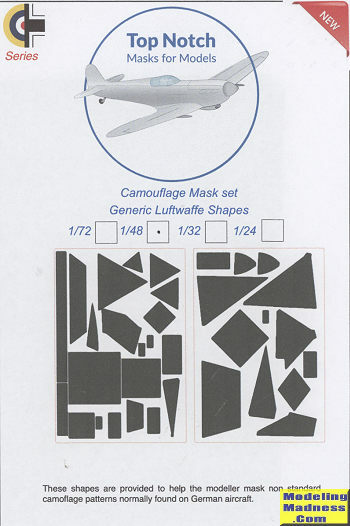 For those who, like me, like to build Luftwaffe aircraft, this set is going to come in very handy. 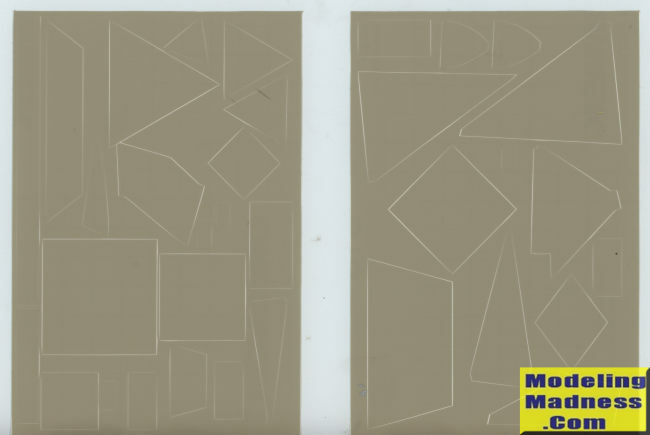 Early RLM 70/71/65 splinter schemes can be tricky, but now Top Notch has helped us by offering several sheets that give us generic shapes to use on our next project. There are two different sheets provided and we are also given three sets for a total of six sheets. Each sheet is about 4x6 inches in size and is made of that easy to see light brownish-green tape. One simply looks at the markings diagram then picks the bits that fit the shape needed. Easy. Not only that, but I'll bet these can be reused if one is careful. These sets come in four scales; 1/72, 1/48, 1/32, and 1/24 with the price being different for each one. This set is 1/48 scale and I know it will come in very handy. Check them out at the links below. I should mention that shipping from the UK to the US is no where near as pricey as the other way. I should also mention that this set cooperated in that I was able to get a good scan of the sheets that didn't show a solid mass. I wasn't so lucky with others!